When the Forgotten Mountain was released I was in the middle of finals for two of my college classes. As much as I wanted to open the pages of what I was sure to be another perfect and escape worthy read in The Collectors' Society series, I had to wait. I didn't even buy it on kindle or purchase a hard copy because I knew that if I had it that easily accessible I would have cheated and spent an entire day reading it rather than do school. So instead, I used it as motivation to get my finals done as quickly as possible. I busted a** knowing that I would be able to finally read more of Alice, Finn and the entire Collectors' Society gang. There was of course the pride in getting a good grade but lets be honest here, I was totally busting a** for The Forgotten Mountain. When the day of submitting my last final came I was finally free! 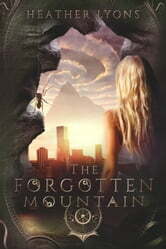 I headed straight to Amazon and ordered the paperback of The Forgotten Mountain. Yes, I totally could have order the kindle version and read it instantly, but there are some books that must be purchased in paperback. If there is ever an apocalypse, my kindle is going to turn into a hunk of crap. If I am left with no power and an unlimited amount of time to huddle up and hope to not die, I plan on having the entire Collectors' Society series with me in my pack. Just saying, one needs to be prepared for things such as this. Plus, I have Amazon Prime, and live in LA so I get next day delivery. Alright, on to what I thought of The Forgotten Mountain. It kicked a**. It was awesome, dangerous, unpredictable and romantic. Alice and Finn are always fighting to save one another, never really getting to be a normal couple. But lets be honest, they are in no way a normal couple; if they were, this series wouldn't be nearly as addictive as it is. Normal couples don't travel between realities, chase down bad guys or make blood promises. Alice and Finn live in a world where spiders are loyal allies, giants are slayed, and true love really does save lives. A world where realities are twisted and one must rely on what is in their heart to guide them. Heather Lyons has created yet another book within The Collectors' Society that had me turning the pages as fast as I could. This series is written to perfection, giving just enough to keep me in the middle of all the action but never giving it all away. I keep reading not only because I have become loyal to these characters, but because there is actually a reason to keep reading. It feels as though I am right there with Alice, discovering and participating in the adventure with her. One of the most magical side effects of reading a book is getting completely lost in a world of fantasy. The entire Collectors' Society series is a perfect example of a world that you can become completely, beautifully and magically lost in. The words on these pages are beautiful and poetic and while they take place in a completely fantastical world, the morals can be applied to real life. The Forgotten Mountain ends with yet another challenge to overcome and I think this next one might be the most difficult one for Alice yet! I can't wait to get my hands on it! The third in the series is no less captivating than the first two, if I thought The Hidden Library was my favorite, I have to tell you now that I have changed my mind. This one, The Forgotten Mountain is my new favorite of the series, until of course book four comes out. Alice's partner/ lover/ best- mate Finn has gone missing, her wrath knows no bounds as she tears through the lies of the enemies. In this book, Alice, Mary and A.D works hard to find their missing comrades, No stone left unturned, no enemies left standing. This version of Alice is the one that I like most, because for once, a girl is not afraid to get her hands dirty to keep the ones she loves. While some might find her bloodthirstiness (and her guard spider) a bit hard to swallow, but I like heroines that are not afraid to show their darker side, or their determination to destroy everything until she gets her way, sort of like an anti- hero, because she never called herself a hero anyway. Halfway through the story Alice finds what she is looking for, or part of it anyway. New allies, new mission and together with Mary her unlikely partner, they managed to find new answers to the question of: Who is Gabe Lygari... So this plot is rapidly turning into a messy situation where readers have more questions and answers: who is the enemy? Is the Librarian good or bad? Who might turn up in book four,my bet is someone nasty, as more villains are turning up where they are not supposed to be. Will Alice get her happy ending?